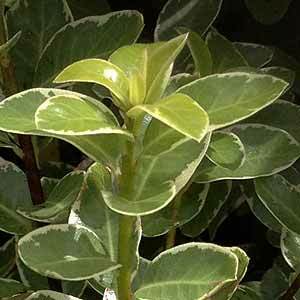 Pittosporum species and varieties include both taller growing hedging plants and low growing types. They have become one of most widely used screening plants in both commercial landscaping and home gardens. Wholesale growers offer a wide range of plants suited to different landscaping uses. It is the variety of leaf colour and size along with different growth habits that make these such a useful plant. A fast growth rate, and an easy to prune nature are two more aspects that make them so popular. Botanical Name – Pittosporum Tenuifolium is the most commonly used species. Common names – Silver Sheen, Green Pillar, Golden Pillar, James Stirling, Silver Stirling, Silver Song, Golf Ball and others. Leaf – Leaf size varies, the small leaf varieties are best for more formal hedges. Aspect – Full sun to a little shade. Deep shade tends to lead to leggy growth. Foliage Colour – Varies from deep green to pale and mid greens, some with variation on the leaf margins. Flowers – Generally small and not a feature. Height – Varies according to cultivar from less than 1 metre to 3 metres. Planting distance – As a general rule for taller growing varieties – For a 3 metres plant at 1 metre apart. Closer for lower hedges, check depending on variety. Pruning – Regular pruning from an early age will give the best results for a hedge. P. tenuifolium argentea nana – available under names such as ‘Wheelers Dwarf’ , ‘GolfBall’, ‘Shorty’, ‘Silver Night’ and ‘Miss Muffet’. P. tenuifolium is the most widely used species with many cultivars. P. angustifolium is the ‘Weeping Pittosporum’. P. tobira is called ‘Japanese Cheesewood’. P. revolutum is commonly called the Brisbane Laurel. A tough and hardy plant Pittosporum is also easy to prune as a formal hedge. With a few pointers anyone can successfully maintain a neat hedge. The first factor to take into consideration is that early formative pruning will make life easier later on. With any size hedge commence by determining the lowest level to be pruned to, this is always at least the lowest part of the hedge or lower unless of course you have a gap. So looking at the top of the hedge determine a good line. Once you have determined the height you are ready to go. However it is easier to start pruning the sides as this will allow you to get closer to the hedge when you get to the top. The sides should be pruned to be a little wider at the ground level than at the top, this allows more light to get to the lower part of the hedge, not essential, but desirable in shaded positions. You can use shears, loppers or mechanical hedge trimmers. Just remember that leaders of branches thicker than a pencil may need loppers. Pruning in summer when it is to hot. Pruning to hard, anything over 1/3 can cause problems. Pruning older hedges hard can cause stress.